The Aurea was an Italian automobile manufactured in Turin from 1920 to 1929. This small producer built sidevalve and overhead valve four-cylinder cars with engines that started at 1460 cc in the s.v. version engine, but later were increased to 1479 cc in both s.v. and O.H.V. engine configurations. 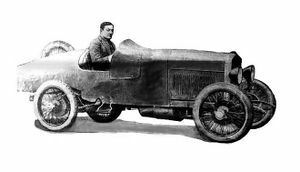 Only the "S" type MONZA factory racing version contained the OHV type engine. The cars were well-made, but fairly heavy. Regular production of Aureas stopped around 1926, but the company produced a few more cars from existing parts and maintained parts supply under for the vehicles under Ceirano new Management from late 1926 onwards. 1. 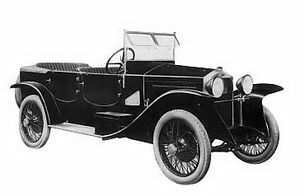 Series 400 model - 1920 to 1922 production; No "S" versions, 5 passenger body styles; 1460 cc, rear wheel brakes only, wooden artillery type wheels. 2. Series 500 model - 1923 to mid 1925, "S" type OHV introduced as top line model - 4 wheel brakes and wire wheels; all other passenger models have 2 wheel brakes and wooden artillery wheels and are rear wheel brake only. 3. Series 600 model - mid 1925 to late 1926 - Body style changes to increase width of passenger compartment; radiator badge contains abbreviation "FATA" re: Fascist era of production (early Aurea's do not contain this). "S" OHV version still in production. Aurea Factory site is located in Turin, Italy and close to FIAT. Factory survived from 1926 to WWII under Ceirano management producing Aurea spares and Ceirano Commercial vehicles (not cars). Factory was bombed and lost in @ 1941 (supposed date). Series 400 - 1 remnant vehicle in Australia, NSW; One ex Australian vehicle now being driven in UK. Series 500 - 1 low mileage original vehicle at Biella, Italy. Series 600 - 1 only example, running and complete with Australian (Wagga based) body, in Melbourne. 6 vehicles are confirmed as arriving in Australia - at least two OHV versions arrived, 1 only Series 600 arrived; At least 2 series 400 arrived in Australia; At least 1 Series 500 arrived in Australia. two Australian agencies were known - 1 at Paramatta Sydney and 1 in Wagga Wagga, N.S.W. An original "Monza" OHV Aurea factory team racing car located in Sicily - This vehicle has a MONZA factory racing origin. The Aurea 1500cc S.V. engine is similar to a FIAT 501 design. Aurea use American 6 Volt Westinghouse starting and generating systems. generator is mounted in gearbox and similar to the Metallurgique car arrangement. Aureas were only exported ex Italy to England, Austria and Australia. Italian vehicles received Italian made bodies; Australian bound vehicles were exported via England and contain either a British made body or Australian made body. Only two Australian new-sales agencies were known - 1 at Paramatta Rd. Paramatta Sydney and 1 in Wagga Wagga, N.S.W. No known agencies existed in Melbourne or any other Australian State. An original OHV Aurea factory team racing car survives located in Sicily - This vehicle has MONZA factory racing origin. These vehicles raced at MONZA competitively for 1 or 2 years reliably but unsucessfully in their vehicle class. Aureas were only exported ex Italy to England, Austria and Australia. Italian vehicles received Italian made bodies; Australian bound vehicles were exported via England and contain either a British made body or Australian made body. All Aurea have a typical "gable" type bonnet and scuttle arrangement similar to late 1920's FIAT and all Ceirano, Lancia and other Italian makes of that period. The Aurea 1460 and 1490 cc S.V. engine is similar to that of a FIAT 501 design, but is unique. Aurea engine and drivetrain components can only be identified by a cast oval containing the word "Aurea" at top centre of gearbox bellhousing, as per Ceirano vehicle arrangement. Aurea use American 6 Volt Westinghouse starting and generating systems. generator is mounted in gearbox and similar to the Metallurgique car arrangement. Aurea vehicles contain Veglia instruments from the Veglia family of Bolongna Italy; later verions contain O.S. instruments as a variation of the Veglia standard type. Amp gauge is American Westinghouse and oil gauge is "Aurea" insignia marked. All Aurea vehicles are right hand drive formation, as this was law in Italy before that countries road laws changed; hence they were suitable for British and Colonial use. Series 400 Aureas contain a 3 speed gearbox; Series 500 and 600 vehicles contain a 4 speed gearbox with a central mounted gear change gate and a reverse "block - out" button located in centre of gear knob. Top speed of the later 500 and 600 series models in standard production form is @ 40 miles per hour. The OHV "S" versions typically have two-seater aluminium bodies and an extra 15 to 20 mile per hour top speed and much better stopping capability. The steering box of Aurea are virtually identical to the FIAT 501 model but do not contain the characteristic FIAT throttle arrangement. Aurea vehicles have a throttle knob located longitudinally parallel to the steering column rod and protrude through toe board plate. Aurea contain a "carden-shaft" rear end similar to the FIAT design. Cooling systems are of the thermosyphon type with no water pump. The carburettor is of the sidedraft type SOLEX design and are a rarer 28 mm SOLEX throat diameter. Four cold-start priming caps reside in-head for winter starting. Battery location is underfloor for non-Italian vehicles and running board mounted (in-box) otherwise. Magneto is the Marelli brand, located on vehicles passenger side and reverse rotation to that of FIAT 501. Interior body trim on all vehicles is of a very high standard for the vehicles market segment; In-general the vehicles were aimed at the middle-car market and appealed aesthetically with "higher than average" upholstery quality and internal fitting apointments. The steering wheel of an Aurea is exactly that of the Lancia Lambda and is moulded in "Shellanite" (Shell brand bakelite). English and Australian passenger compartment body styling resembles that of the English "Clyno" car, but is approximately the same dimensions as the larger FIAT 501 vehicle. Series 400 and 600 Aurea vehicles contain single bulb headlight arrangements similar in style to that of German "Bosch" brand shape, and contain the cast word "Aurea" at the top front of the headlights cast aluminium bezel. Series 600 vehicles contain a rarer twin bulb headlight, similar to Bosch Lancia Lambda style, but are of the Italian "Carello" brand and are all-brass with a unique Carello headlight glass. The tailight assembly is a cylindrical type and similar, but not the same as FIAT vehicles. British tailights are rectangular and "jeweled", being similar to that of the English "Clyno" Car. The Aurea is a rare and obscure vehicle, rarely seen in the world. The above text captures scant knowledge of these vehicles and stands to be corrected by anyone holding more detailed and concise information. The entries reflect the limited knowledge of one lonely Aurea owner whom which the information has been gained over a 15 year period. The only known and most useful source of information on these vehicles is contained in the archives of the National Italian Motor Museum in Turin Italy. The above-listed information should only be taken as a compliment to that reference source, which also contains examples of English manufacturing information, particularly body styles. Some information on technical details is contained at Lord Maontagues Beaulie Museum archives in the United Kingdom, particularly a reference copy vehicle manual of the Series 400 car type.